I remember years ago, while reading "The Autobiography of Malcolm X," one small incident stood out to me. As a child of 13, he had his first experience with the Juvenile Justice System when he was placed in a locked facility for putting a tack on his teacher's chair. That would have been in 1938 and I suspect that those kinds of things were fairly common at the time. Children were not afforded the same rights as adults when it came to things like incarceration and the right to the presentation of evidence of a crime before punishment was meted out. Those things changed in 1974 with the passage of the Juvenile Justice and Delinquency Prevention Act, an outgrowth of the Great Society Programs. The major thrust of that legislation was to say that juveniles have to commit an actual crime in order to be locked up. As part of this movement, community-based agencies grew up all over the country to work with youth who were behaving badly, but had not committed actual crimes. ...young people are no longer at risk: they are the risk; young people are no longer troubled; they are trouble. And we're no longer talking just about "young people"...we're talking about children. We'll leave the discussion about the changes to the juvenile justice system for another day. Today I'd like to focus on how this has affected our schools. I'm sure you've probably heard some of the anecdotal stories...like the one about the 5 year old girl in Florida who was hauled off in handcuffs by police for having a temper tantrum at school. Then there's the story of 12 year-old Alexa Gonzales in New York, who was arrested for doodling on her desk, and the 13 year old boy in Maryland who was arrested for refusing to say the pledge of allegiance. Stories like this are cropping up in the news pretty regularly these days. The judge who was interviewed for this story makes the point...we are criminalizing the behaviors of children that were formerly handled by teachers and principals. The effect of this on children and their education has been documented by the ACLU. Not surprisingly, studies show that being arrested has detrimental psychological effects on children. An arrest nearly doubles the odds that a child will eventually drop out of school. Coupled with a court appearance, an arrest nearly quadruples the odds of dropping out and increases the likelihood of future interaction with police. Arrests and police interactions also disproportionately affect low-income schools with large African-American and Latino populations. 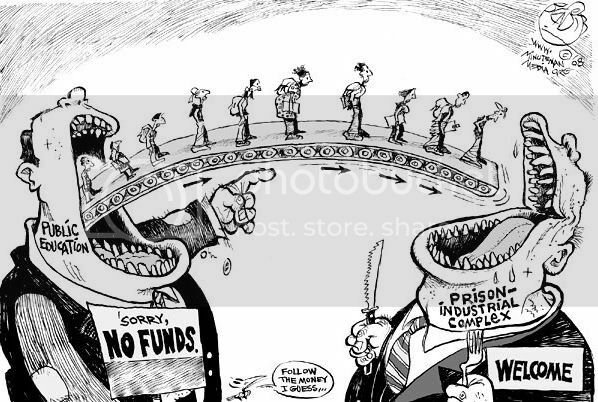 In essence, being arrested in school robs children of their access to educational opportunity. Many have labeled this pattern the school to prison pipeline. Once again, Henry Giroux describes what is happening. Students being miseducated, criminalized and arrested through a form of penal pedagogy in lockdown schools that resemble prisons is a cruel reminder of the degree to which mainstream politicians and the American public have turned their backs on young people in general and poor minority youth in particular. As schools are reconfigured around the model of the prison, crime becomes the central metaphor used to define the nature of schooling while criminalizing the behavior of young people becomes the most valued strategy in mediating the relationship between educators and students. The consequences of these policies for young people suggest not only an egregious abdication of responsibility - as well as reason, judgment and restraint - on the part of administrators, teachers and parents, but also a new role for schools as they become more prison-like, eagerly adapting to their role as an adjunct of the punishing state. The result of this transformation of our schools has been documented by organizations like the NAACP (pdf), the ACLU, the American Bar Association, and the Advancement Project (pdf). In New York City, with the Police Department taking over responsibility for school safety in 1998, the ACLU recently filed suit against the department over the use of excessive force and wrongful arrests in the schools. While I appreciate the Obama administration's focus on education, it seems to continue the idea that the problems can be solved without addressing this very fundamental issue. As long as we see our children as potential threats to be feared and controlled, we'll continue to lose too many of them to the criminal justice system...at a very high price both in dollars and human suffering. While there are many policy issues that must be addressed to improve this situation, I believe that first of all, it is a problem of imagination. So just imagine with me for a moment if all of our schools looked like this - its possible!!!! This is what our children would ask of us and what they're willing to give in return. Sometimes, it will mean recognizing the reality of the world in which too many of our children live and finding ways to engage them - honestly - about their expectations for themselves. I'd suggest that anyone who's interested in understanding the challenges faced by our urban schools should watch this 4th season of HBO's series "The Wire." The main storyline follows 4 middle-school African American boys in Baltimore both in and out of school. If we can imagine a way to reach them...we'll have all the answers we need about how to end the school to prison pipeline and create an educational system that works for all of our children. Thank you for blogging this issue. It is absolutely one of our worst problems in the U.S. and deserves much more attention than it gets. Your article is extremely well written and right on point. I especially appreciated seeing the 'conveyor belt' cartoon. This issue has never been made more clear than that.